Looking for an end destination for next year’s December road trip? Kayla Cloete has compiled a list of coastal escapes that will please both the outdoor enthusiast and his/her comfort-loving companion alike. 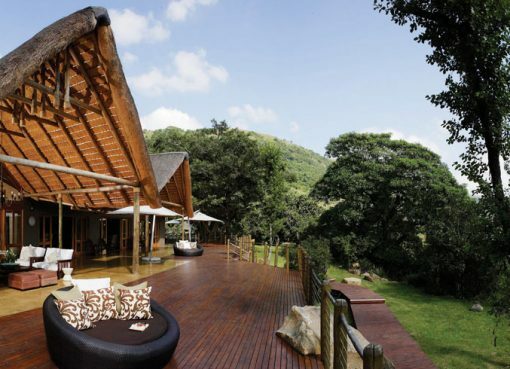 Pitch your tent on the banks of the Touw River in Wilderness at the SANParks Ebb & Flow Rest Camp. Located just a few kilometres from the Wilderness Beach, this coastal camping ground is so large that it is divided into two sections – the North rest camp is geared towards the needs of budget campers, while the South rest camp offers more spacious campsites with exceptional views of the river and mountains. Well-maintained communal ablution and scullery facilities are available for all campsites in both the North and South sections of the park. You might be forced into roughing it somewhat more here than at other campsites, as only some of the sites in the South have electrical plug points for caravans only, but the peace and tranquillity of this gorgeous riverside wonder will make it all worthwhile. Located a convenient distance away from the Garden Route Mall (so that you can stock up on supplies and anything your spouse – could not have been you – may have forgotten to pack), as well as the many golf courses in the area, Victoria Bay Caravan Park is an idyllic coastal retreat with a feeling of utmost exclusivity. There are just 36 grassed camping stands available – of which 25 overlook the ocean. All sites have their own braai facilities and electric points. Sites 17-29 on the Western Terrace have their own private ablution facilities on site, while the private ablution blocks for sites 30-36 are found a mere 50-100 meters away, and Railway Terrace and Sea Breeze Terrace (the other two sections of the park) have communal ablution facilities. Bookings for December 2018 and January 2019 open early, so be sure to keep checking their website if you want to secure your place for the next holiday season. 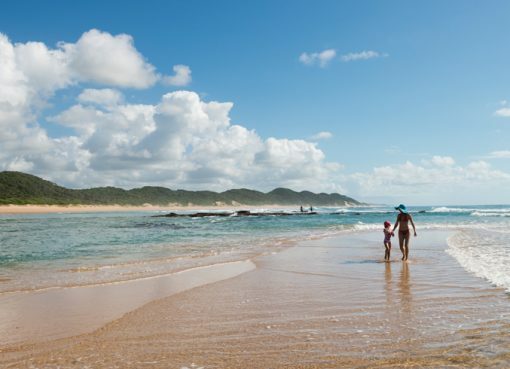 Situated near the mouth of the Keurbooms River, this resort is a picturesque nature reserve located a stone’s throw away from the famous beaches of Plettenberg Bay (the nearest beach is just 5 km away). The resort offers a plethora of activities, from ferry cruises and rentable motorboats and canoes, to a putt-putt course, trampolines, public swimming pool, and school holiday programs to keep the youngsters occupied. 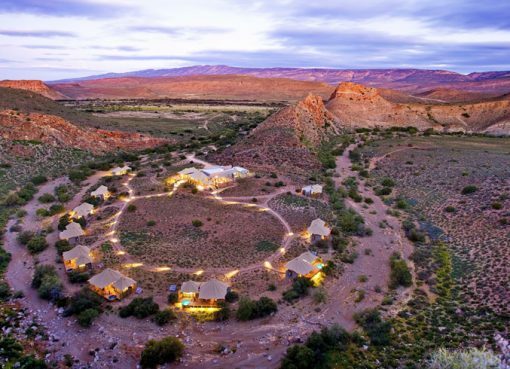 The resort has a total of 33 River campsites and 83 standard campsites (all with access to electricity points and serviced by three neat ablution facilities) available for bookings. For those who have forgotten to book in advance, a limited amount of camping stands will be allocated by the Resort on a first-come-first-serve basis between 10 December and 15 January (so you still have a chance to get a spot here this year if you get there early!). Just 1.5 km from the Morgan Bay beach, Yellowwood Forest combines the serenity of coastal camping with all the fun of a river retreat. The Morgan Bay dam is a short walk away, and is ideal for bass fishing, swimming, and canoeing. There are also various forest trails to explore, as well as a gift shop, tea garden restaurant, pizzeria & bar, playground, and Wi-Fi access throughout the resort. Go “glamping” on campsites A-L (all of which have access to plug points), or rough it on sites 1-18 (these sites are without electric points). Small, simple stone circles cemented low in the ground act as the braai spots for the campsites, but there are no built-in braai grids, so be sure to bring your own. The hobbit-like ablutions buildings are clean, full of character, and centrally situated to service all of the campsites. For a campsite with an unrivalled setting, look no further than White Clay Resort. Situated 1 km outside of Coffee Bay, this rather exclusive-feeling resort overlooks rolling hills, rocky cliffs, and its own private beach (ideally suited for fishing and swimming during low tide). Relax at your campsite while watching dolphins and whales frolicking in the bay, explore the site’s hiking trails, or simply spend the day swimming, fishing, and surfing at the beach. All campsites have electrical points, and are serviced by well-maintained ablutions. A fully stocked curio shop, bar, and seafood restaurant is located onsite for added convenience. The whole resort is situated in a fenced complex with 24-hour security, so you can sleep peacefully while listening to the waves crash against the shoreline. Camp in a tropical forest alongside the calm waters of a lagoon and listen to the roar of the Indian Ocean surf in the background at this family-friendly resort. The campsites surround a central recreational lawn with pool, playground, games hall, communal braais, and dry pub. Ablution blocks, with scullery and laundry facilities, are scattered throughout the camp. Power connections are available to all sites, but it is advised to bring a 25 metre extension cord to access it. Super Sites are available to those who require extra space, and come with their own built in braai, table, and bin. For all other sites, campers must bring their own portable braai if they want to have their own campfire going at their site. Otherwise, head to the communal braai area, or pop into the onsite Raffia Restaurant, open for breakfast, lunch, and dinner. Just a few kilometres away from Alkanstrand Beach, and at an advantage of having its own private beach, Richards Bay Caravan Park is a neat little spot with loads of activities for the whole family to enjoy, including deep sea boat trips and a game of putt-putt at the onsite 18-hole mini adventure golf course. The resort also has its own fish cleaning area, children’s playground, trampolines, volleyball field, giant chess set, paintball field, and a large swimming pool. 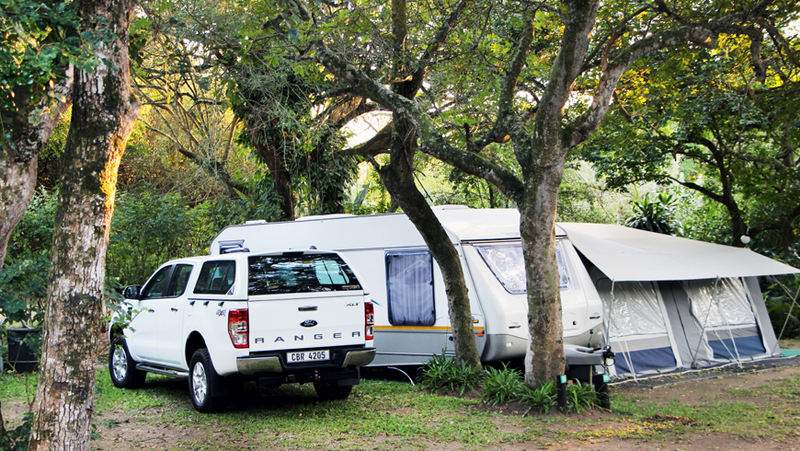 There are a total of 261 caravan or camping sites, all of which are grassed sites of a generous size, shaded with electrical points and equipped with their own on site braai’s. Neat, well-maintained ablution blocks service the campsites of this safe, gated resort with 24-hour security patrols.